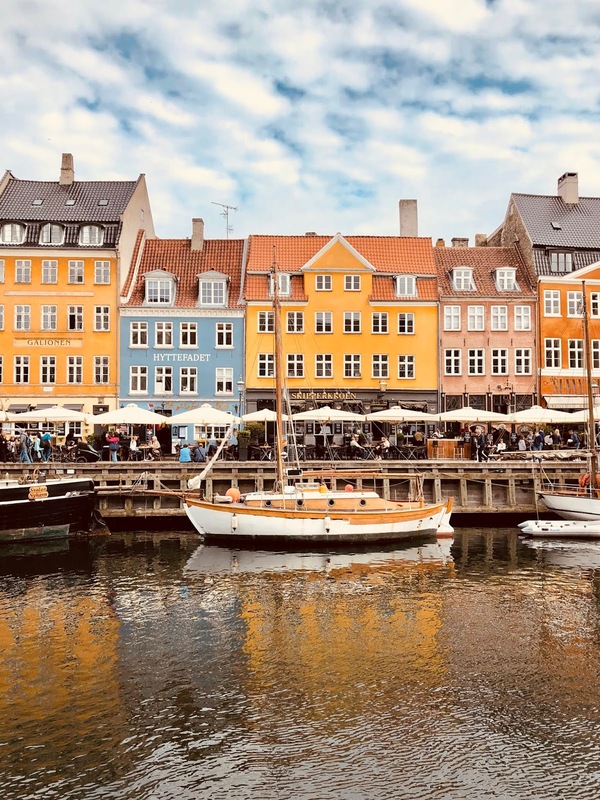 Known to be the Happiest place on Earth, Denmark's capital, Copenhagen was our next adventure spot. Wakeup Copenhagen was exactly that with a beautiful City View as well. It cost us £234 for 2 nights. It had a Bicycle parking and even their own bicycles for rental. It was just 11 minutes walk from the Central Copenhagen Station as that is where we arrived from the airport after just a 13 minute Train costing us £7 for two people one way. £7 back from Copenhagen Central to the Airport. £14 for two people, airport transportation. As we both had a long previous week, we decided to spend the day in our Hotel room relaxing and heading out to Dinner at this Pakistani Restaurant called Kebabish. You can find the Copenhagen Food guide HERE. Click for all the places we ate at and their details. Anyway, after stuffing ourselves with delicious desi food, we moved on to walking around. Places might not be open by around this time of the Year, the Sun doesn’t set till 10 pm at least, infact it wasnt all the way dark till Mid night so walks around the city is a good idea. Admiring the architecture and marking places for your next day when you start early and fresh. We started day two by waking up reasonably early and we were out of the hotel by 9:30 am which is late for us to be starting but HEY this is one of the “laid back” trips so it’s alright. We walked to the Central Copenhagen Station and unlocked our “Bycyklen Copenhagen” bicycles which made our entire Copenhagen experience OH-SO-CONVENIENT . A little about Bycyklen. They are electric bikes. The battery runs for a good 45km in our experience. If you are planning on riding it for longer, no problem, there are a ton of docking stations around Copenhagen, easily accessible, with plenty of charged bikes waiting for you while you drop off the previous one. The process is easy. You make an account online at Bycyklen.dk , you set up your account by adding a username and password which you should remember as that is what you will use to unlock the bikes from their docking stations and off you go. You can park them anywhere like other bikes when you are stopping somewhere but to end your ride, you must park them at their proper docking station to avoid any penalties or extra charges. Moving forward, as we mentioned that we started our day by getting these bikes, heading to Nyhavn which is the most popular street in all of Copenhagen. 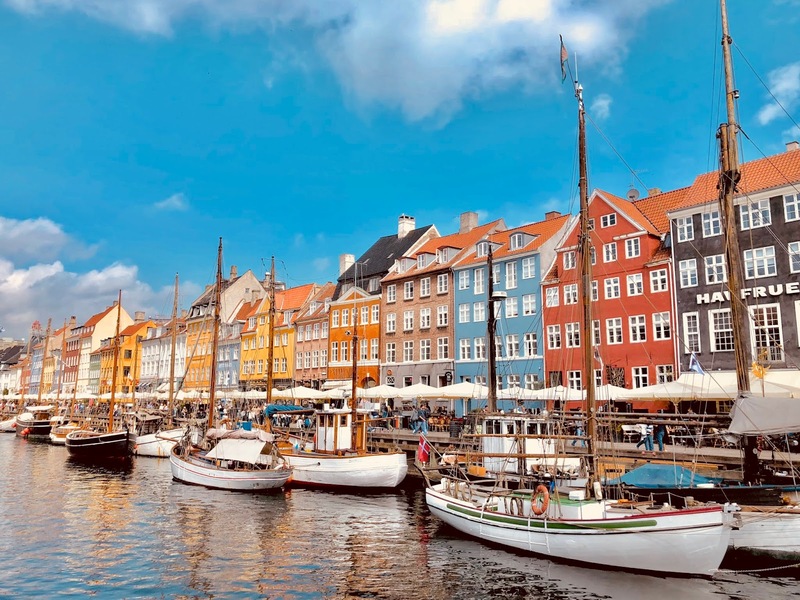 Full of vibrant colors, Restaurants and ships, this street gives you a taste of Copenhagen’s culture. If you get their early, the crowds aren’t too bad but they increase by the hour. Next we visited Christiania which is a community with in a community known for its “different” way of being. It is not safe for visitors to be taking photos and filming because weed is openly sold and purchased there and it is illegal in Denmark. You can see “no camera” signs in places as well. It was a fun, colorful neighbourhood to visit. There were a bunch of Local eateries and a ton of Music and Art. Worth a visit because why not. Now we were in a mood for some dessert. Already? Yes! So we visited Munchies. The biggest, bestest, bubble waffle place in all of Copenhagen and you may read all about it right HERE. Look how yummy! 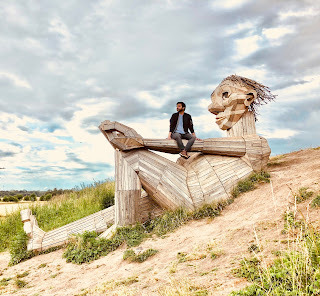 A while back, I saw the amazing story of the “Six Forgotten Giants” in Copenhagen. As soon as I read the title, it grabbed my attention. They are basically by an Artist named “Thomas Dambo” who did a brilliant job at installing these Giants all over the area and it is a fun activity to find them while visiting Copenhagen. This was next on our agenda. It was never our intention to find all 6 but when we found the first one, best feeling ever! So amazing. We wanted to find one more but that trip drained us as we were on Bicycles and it was time that we were super hungry so we started heading back to Copenhagen. This trip was 40 minutes ONE WAY! For our Lunch that day, we went to Sampi Pied which is a Halal, Turkish Joint, details can be found right here. Like I said, the giant search drained us so went back to the hotel for a little break of an hour and then we were off to visit the Little Mermaid. 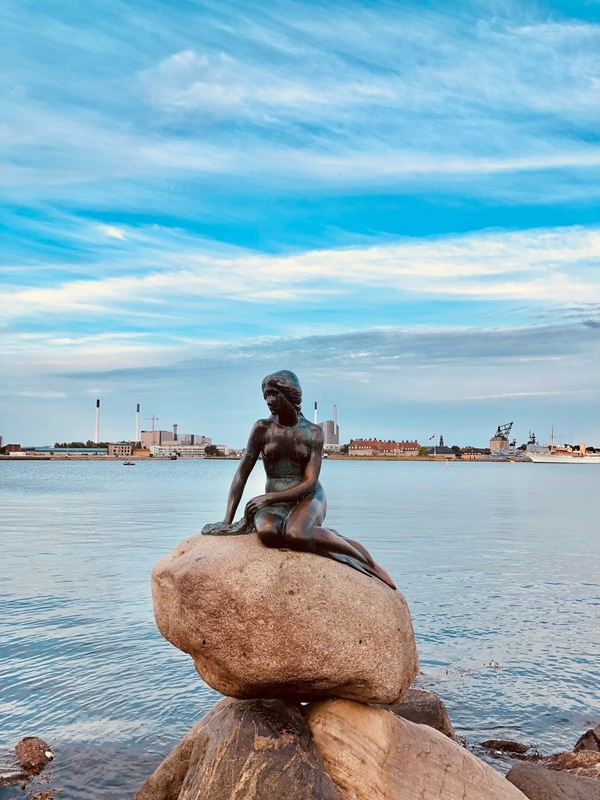 You cannot leave Copenhagen without visiting the Little Mermaid. This Fairytale city demands it. It was quiet a wonderful bicycle ride to the little mermaid and the area around is shaped like a Star if you look at it on the map. You will see some beautiful yachts parked as well and lovely walking and bike trails. A fun place for the evening to stroll and chill. 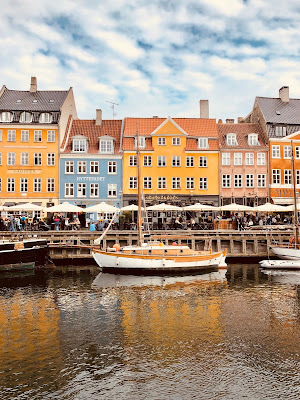 We ended our second day in Nyhavn because on our way back from the little mermaid, we passed through it and after hours, the water was so peaceful and it gave us a mirror reflection of the Nyhavn buildings. We rode our bikes around the city for a bit longer before we went back to the hotel for the day and were ready for the third and final day of exploration in Denmark’s capital. Day 3 is upon us and we first headed to this beautiful square called Grabrodrehov. It has red, orange and yellow buildings which give you a breathtaking view and it was really peaceful in the morning before all the restaurants and cafes opened up. Oh, it an awesome spot for Lunch. Next, it was time for us to put some coffee in our systems and I had Original coffee on my list for Copenhagen. This branch of Original coffee gives you incredible views from the rooftop. Details? You know where to click. Next stop was Rosenborg castle.Rosenborg Castle is a renaissance castle located in Copenhagen, Denmark. It is quiet pleasant to walk around. Rosenborg Castle features 400 years of splendor, royal art treasures and the Crown Jewels and Royal Regalia. Frederick’s Church is a piece of Art based in Copenhagen which you can site from many different locations while riding around Copenhagen and it definitely deserves a spot on your ”To-Visit” list when traveling to Copenhagen. Okay, it is not like were obsessed with this street but it just happened to be on our way often when we were trying to get to places. While trying to get to Tivoli Gardens, we stopped at Nyhavn for the day. Time for some amusement park fun. 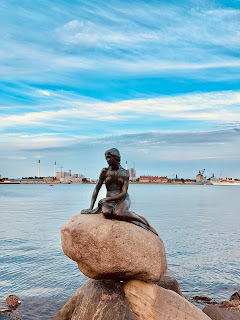 How cool is it that there is an amusement park right in the middle of Copenhagen and it is a top attraction when visiting this city. Our trip to tivoli was sponsored by Tivoli Gardens. It is not just an amusement park full of super fun rides for all ages but also offers a display and variety of flowers. We saw several cultures while walking around Tivoli. It seems to have a huge impact from the Asian culture as we saw Chinese Lanterns quiet often while in Tivoli Gardens. What time is it? SUMMER TIME (High school musical) . Yes, but also time for Lunch. How convenient that Tivoli gardens is full of vairety in food. We headed towards Tivoli Food Hall for some Pizzas. Gorm’s pizza obviously. These were probably the best two pizzas we tried. Read all about it here in our Copenhagen Food guide. It left us oh-so-stuffed. As mentioned earlier, the area around Little Mermaid is quiet peaceful and lovely. We went back to ride our bikes near the water and that is when we came across this magnificent fountain. We spent a little while there before getting back to Copenhagen Central Station where we parked our Bycyclen back their Docking stations, grabbed donuts from Dunkin Donuts and ofcourse a coffee and we were on the Train towards the Airport. Really enjoyed the read! So informative! Looking forward to more travel guides.